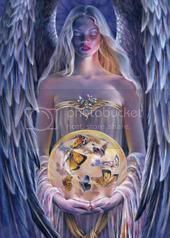 Archangel Ariel- powerful overseer of guardian angels and humankind. Involved with manifesting supply for humans and animals , healing and enviornmental concerns. This morning as I listened to our Opening to Channel meditation from class, Lord Lanto from the higher realms beyond the 5th dimension, Archangel Ariel and many others were with me and shared this message. We are all here to help you and the beings on your planet to evolve as quickly as they possibly can. We ask that you call to us constantly for guidance and assistance because we are here just for that purpose. To guide, protect and assist any who will give a call or thought toward us. We are made up of pure love, totally and complete love. No conditions, no judgments, no strings attached to our love; just pure love for you and for all of the kingdoms that are upon this earth plane and through the entire universe and beyond. We have no expectations. All is your choice and free will so we wait and watch, wondering when you will ask for our guidance. We can so easily move everyone of you though any situation that can surface for your attention. Please ask us to come and help and we will of course always be at your side in a flash. You will sometime see us as a little spark or flash of light. When you see this little sparkle out of the corner of your eye, just smile in the knowing that it is us and we have come at your calling. This makes us so happy when we are interacting with you through the activities of your day. And if you will notice, your day goes so much smoother and is so much simpler if you have started your morning with your call to us. We love you and we are happy to share this information with you today. We hope it has been of service to many. To the many who are already sending their love and thoughts to us and to the many who have not as yet thought they would benefit from us, we are here to say simply , try it. Just give us a chance. You will see for yourself that you are a creator and you have created us to be your help mates in every aspect of this chosen journey on this earth plane. We gladly accepted this position and we always will.